Wee Blue Swirls: There is Gnome like you! It's my day over at Whimsie Doodles and I have a cute little mini card to share with you. I was inspired to make a mini card by Casology challenge blog where the theme this week is... you guessed it..... mini. I thought it was about time to add some wee note cards to my stash and I thought what better to go on a wee card than a wee gnome!! Gnome Wonder, which I used on my card today, is just one of an extremely cute collection of Gnome images available in the Whimsie Doodles Store. I just love them! This card was super easy to put together. 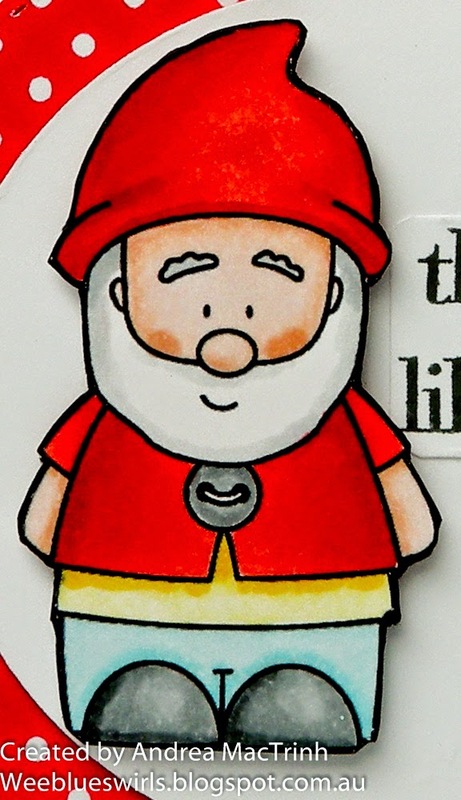 I coloured Mr Gnome with my copics and then cut him out. I die-cut various sizes of circles in Black, Red Spotted and White Card and layered them together. 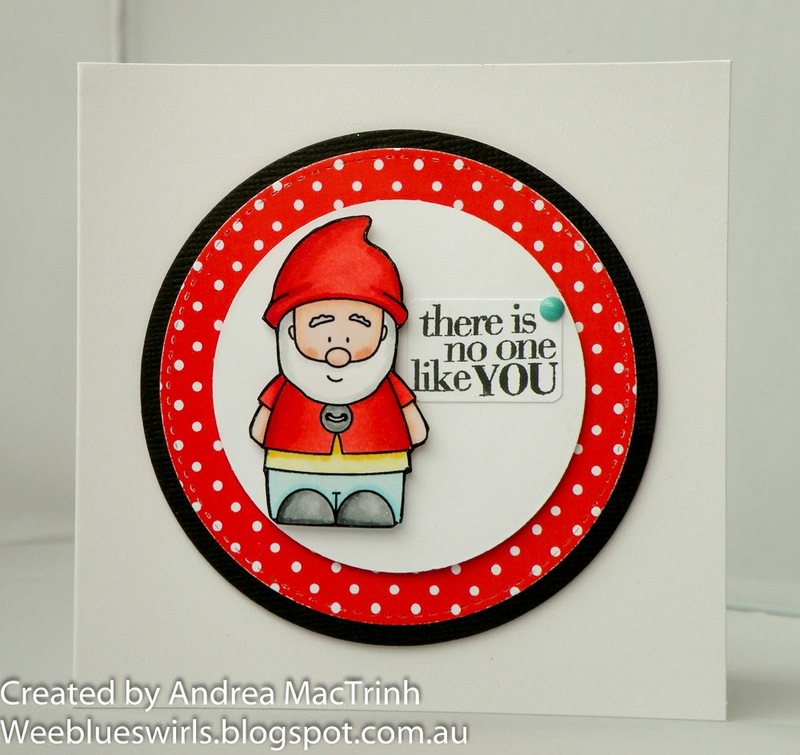 Mr Gnome and the white circle are both attached with foam dots giving the card some more dimension. The sentiment actually has a bracket around it, but it didn't fit with my style of card so I it out and stuck the sentiment onto the white card! I added a doodlebug sprinkle...well...just because I love them!! Delightful and such a cute, clever card!!! In love with your coloring skills and the colors you have chosen to make your image pop!! This little gnome is so beautifully coloured! I just love how you have framed him. Your choice of mini spots with a hint of black is perfect! thanks so much for having a little fun with us at CASology this week! Super sweet wee little card!!! Thanks for joining us at CASology!!! !